July 9, 2018 at 10:01p.m. 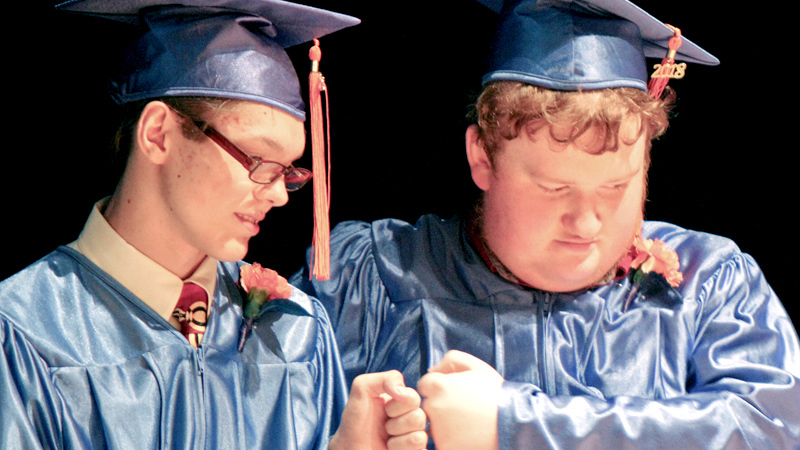 Photo by William D. Lewis | Potential Development High School graduates Gregory Burkett, left, and Edwin Gurney bump fists during Monday afternoon’s commencement at Stambaugh Auditorium in Youngstown. Potential Development High School graduated six exceptional students Monday afternoon at Stambaugh Auditorium. The 2018 graduates are Gregory Burkett, Edwin Gurney, Cody Straley, Tyler Wolford, Anthony Worley and Hunter Zarconi. State Sen. Joe Schiavoni of Boardman, D-33rd, said this year’s commencement is the visual representation of opportunity. That love should enable people to do more together, Schiavoni continued. Worley said the impact Potential Development had on his life is part of what made him, him. Mike Cornelius, Potential Development High School science teacher, said for that reason, he was very upset with the parents and guardians of the graduates. July 18, 2015 12:05 a.m.
March 18, 2008 12:43 a.m.